Hello! Happy Sunday Funday! I hope my American friends all had a safe and sane 4th of July celebration! The challenge is almost over, but if you have any cover plates or full-size dies such as I used in my twofer, you should click on either of the above links and watch the amazing video. Conversely, if you have any colors that need cover plates, you're on your own. I used PTI's Quartre Foil cover plate and the heat-embossed sediment is from PTI's "Signature Greetings" set. 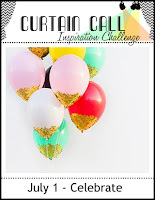 I'm also entering the Curtain Call challenge of "Celebrate," which is running for the whole month of July in celebration of their 3rd anniversary and the birthday celebrations going on over at STAMPlorations in honor of their 2nd birthday! Congratulations to both awesome challenge blogs! 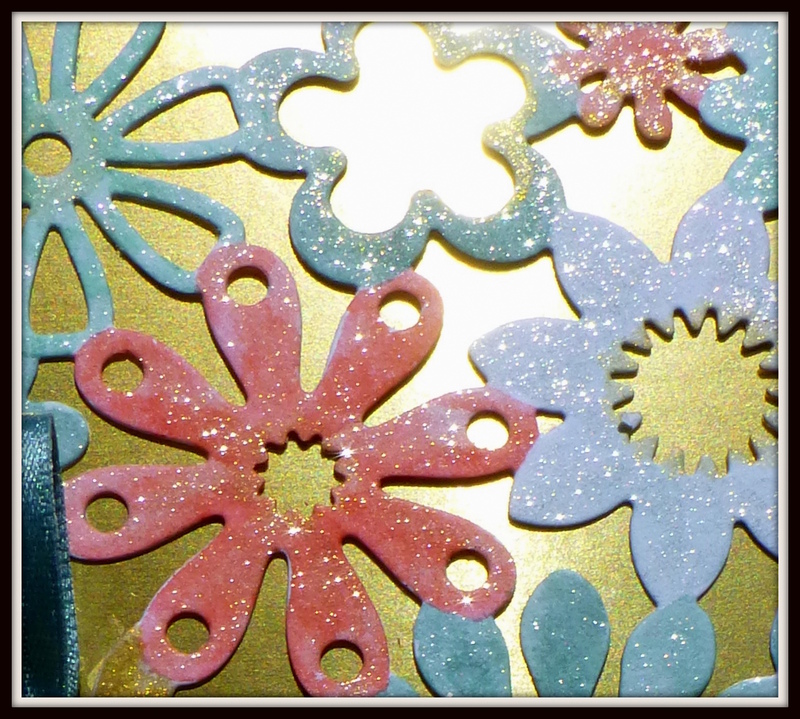 This one was made using my NBUS MFT Die-namics CU die "Floral Fusion." Because I used gold ink for some of the flowers (yes, that's gold, not pooey brown), I backed the plate with a metallic gold paper. The NBUS ribbon is SU lost lagoon. The sediment is an ancient unmarked wooden stamp. Is it just me, or are "twofers" now becoming all the rage in Blogland?! 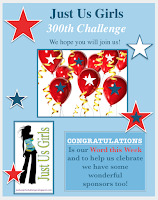 Just Us Girls is celebrating their 300th challenge with a Word challenge and the word is "Congratulations." Congratulations to them for such a successful challenge! All the best to the US Women's Soccer team in today's championship game against Japan! Congratulations to all the teams from all over the world who made it into the competition and played their hearts out! That technique is great ! Your cards .....wow..... love it ! Have a sunny Sunday ! Two gorgeous cards Darnell, great technique, love the flowers. Hope you had a wonderful birthday sorry for the belated greetings! Loving the cards. I like the bright colours. 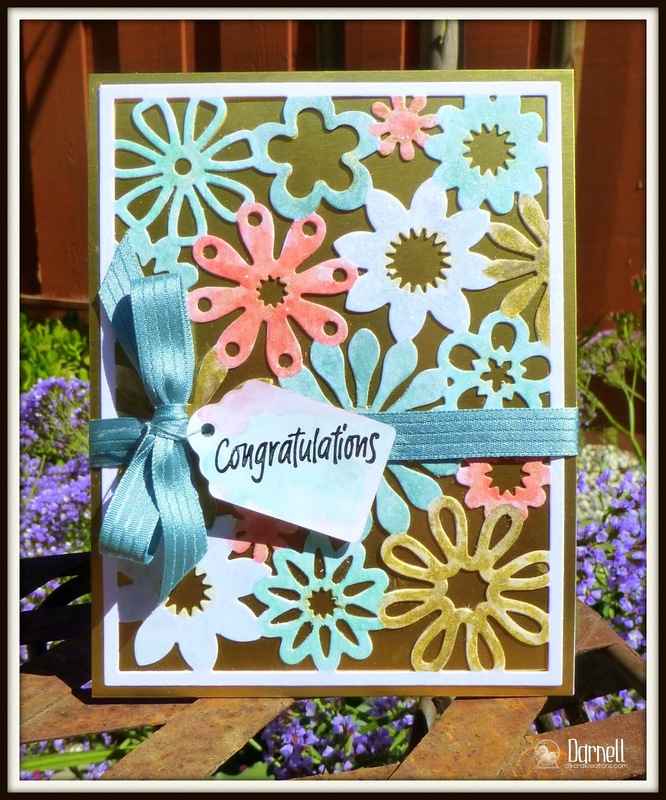 I saw this technique and loved it too, your cards are so wonderful Darnell, thanks for the inspiration! Such a fabulous technique and I love how you showcased it here Darnell! Hope you had a good birthday and 4th July! Oooh, those sparkly flowers - would be great to see them in RL! And the top one with the quatrefoil.....LOOOOVE - that subtle shifting in colour. Amazing!!! These are both gorgous cards Darnell and fabulous colours. Love the cards Darnell! I love Laura Bassen too her coloring and blending is fantastic. A restraining order!!! LOL You carack me up!!! As always super loverly cards Darnell! Awesome dies and great colouring! Great designs! Thank you for joining us at ATSM this week! Your cards are awesome Darnell!! I love the colors!! You are a master of this technique! Probably true because you're Laura's mom (Ha!) 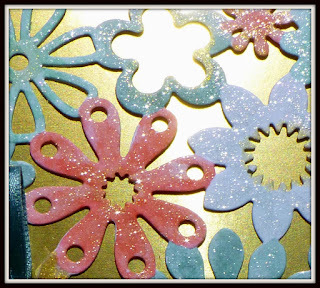 Gorgeous gold posies and bg, and the quatrefoil cover plate is precious in pastels! Always loved that one! Both beauties, Darnell! two very pretty card! I love the flower card! I'm with you -- I love Laura Bassen! Not only is she talented and full of great ideas, but I could listen to her patter all day long! It's like sitting down with a good (and funny) friend. Nice cards! I have that PTI sentiment and sometimes have trouble using it because the "y" is so long. I never thought to cut around it and round the corners. And your colored flowers are beautiful! LOL to the restraining order!!! I love love love your cards!!! Gorgeous colors!!!! Ha...I'm a Laura lover too! :) Love both of your cards..the color choices are divine...and your shine and shimmer. Wow! Beautiful Darnell. Oooh, that Laura is quickly becoming one of my faves, too. I so enjoy her videos. She sounds like she'd be so much fun to hang out with. Sorry to hear about that restraining order. LOL Your twofer is (are?) fabulous! I like how you colored the individual shapes. I'm sure they are even more stunning in person. Lots of sparkle on the second one! Great work, Darnell. Hope you had a great day even if you couldn't cap it off with a fireworks show. Beautiful cards! Thank you for the closeup of the second card as it really lets us see just how beautiful and sparkly it is. 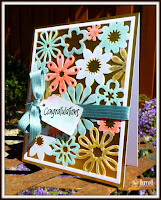 Super gorgeous card Darnell, loving the soft rainbow of colour. Super fun twofer post ;) -- I bet those flowers are stunning in real life - Thanks for joining in at JUGS 300! Twofer...don't think I understand...or is it, that I never do it. Too slow, I guess. But you've taken this challenge and OWNED it! Yowza. These two are spectacular. What a beautiful card. Your cover plates looks amazing. And to come here and get a twofer? I love how you colored the flowers on the second one with all the different colors. Your cards turned out fantastic......you go girl!! I totally understand restraining orders since George Clooney has one out on me...and probably 30 others:) Love these cards and had to snicker at the "pooey brown" since I knew it was gold. I wish the camera would pick up all the glitter but the close-up definitely does. Love both of these! I love Laura Bassen too. She has the best sense of humor and I love her videos. I think if the two of you made a video together we would be rolling in the aisles! I do love the coloring of the die cuts and your cards are stunning. The flower one is especially lovely but both are pretty. I loved SPAM as a kid, not so much any more. At the time it was really cool, meat in a can on the grocery shelf. Who would have thought! Have a happy Sunday. fab cards, I must check out the video later. I must confess to having done a couple of twofer so recently as well - lack of time and a desire to enter some challenges close to my heart were the reason. what I don't see the point of are the 'sixers' and 'tenner' (are those even words?) but you get what I mean. Is it a legit challenge entry if you've just read a blog that collates all the different challenges and tried to squeeze your card into as many different challenges as possible sometimes not even bothering to read the rules of the specific challenges you're entering? Ok rant over (I feel better having got that off my chest). Wowzer, Darnell! You nailed the challenge, my friend! I had to color the frame black, if you know what I mean--LOL! But your frames are still perfectly white. Of course I could have masked, but no, not me--LOL! Hope you had a wonderful 4th! Beautiful selection of colors on your cards. Loving the look of cover plates. Just might have to go shopping as I have lots of colors that need cover plates. Oooh 'eck missus - these are both gorgeous, such lovely colours! I sat and watched your complainant's(!) video and was sooo quiet that the maestro thought I was unconscious! Not normal for me to be quiet you see. I also went to check out her vid 'cos I thought 'wassa cover plate' then the penny dropped from a great height and I realised that I have some of these so will be trying to do this myself. LOL!!! 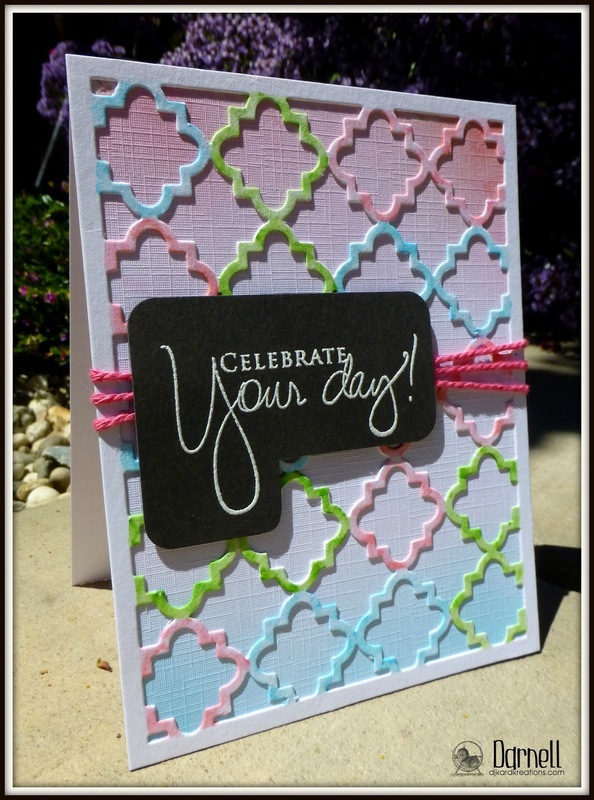 Beautiful quatrefoil card. Love the colors. Your second card is pretty too, but really love the first. Both cards are so pretty. I really love the first one. Great job. 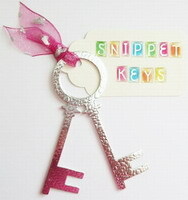 I love these and love the idea of coloring the dies that way. 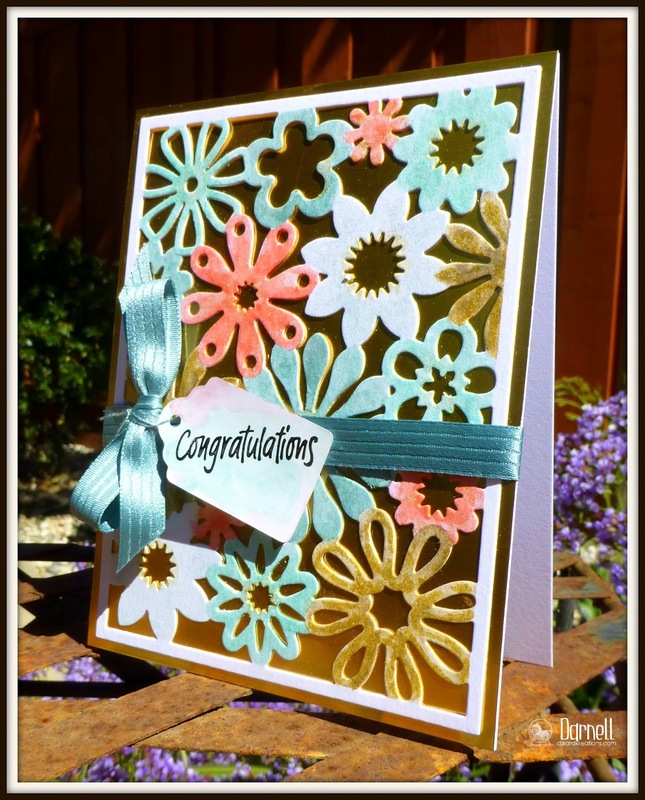 When I get back into card making I will have to try that too. Darn you ... now I am going to have to look at cover-plate dies...arrrggh! Love these cards, the color is so lovely and delicate. Beautiful cards, both of them! What a great technique! I'm going to have to try it. Thanks for joining us at Just Us Girls for our 300th! 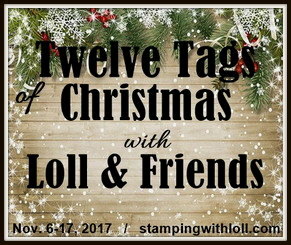 Totally gorgeous Darnell and I have watched the video and I just love the idea and the colours unfortunately I do not have any of these type of dies.... yet! Two absolutely gorgeous cards! Love how you colored both of them, such a wonderful look! I would be hard pressed to pick favorite here Darnell!! You did a fabulous job on both! These are awesome, Darnell. Doesn't Laura make the funniest videos out there/ I could watch her all day. Wow... I love them both. Both are utterly gorgeous and so creative. Interesting about Spam. Mom used to give us that awful stuff in our lunches and to this day, I cannot bear to even think about what is in it, let alone eat it. What lovely cards you created!! And I love Laura too. She is too cute in her videos. I really like how you backed the second card in the gold metallic paper. Gold is so difficult to photograph too!! My goal is always to make twofers but I never seem to meet it. Or if I do, I have to post it on different days just to get posts in. I think you rock the way you have been consistent with posting two cards that you sit down and make. Hi Darnell! 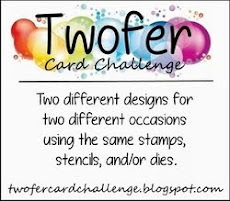 Love your "twofer" cards! The close-up of your second card shows how pretty it is IRL!!! Gorgeous my dear!!! They are both wonderful! I need to try and make a card before tomorrow! So fun! Gorgeous cards and fabulous technique. Thanks for sharing the link! Two brilliant examples of this technique Dippy although when I saw your blog post title I thought you were going to wash your dinner plates!!! 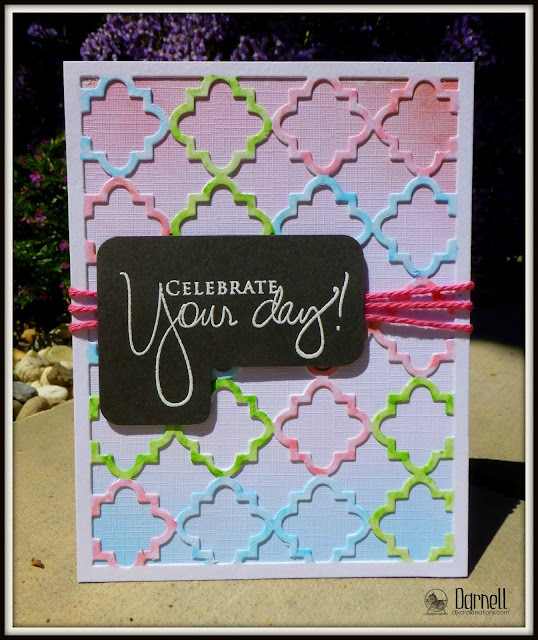 Love the different colors on the way a quatrefoil card and the wonderful shimmer and shine on your second card......definitely winners in the twofer challenges. Terrific cards!! So sorry I missed you birthday ... I hope you had a wonderful day ... Big hugs! 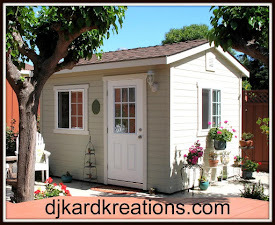 Beautiful job with Laura's technique! I love seeing your twofers, I keep thinking that's a great way to enjoy a technique or products while they are still out there on my desk. I'm too old to be your daughter, but could I claim to be Laura's cousin so you could at least be my Aunt?! Im gonna check out these tutorials, I love the result of your colorful cards and it's always great to discover new methods for using what's already in your stash. Oooo, I'm amazed about both of your cards, dear Darnell. Such a great idea! And wonderful colour choise. Crushing on both your beautiful cards, Darnell! Love the quatrefoil on the first and the floral goodness on the second. 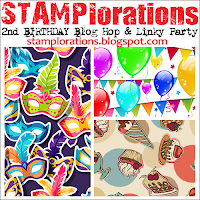 So happy to see you celebrate with us at STAMPlorations -- our birthday's made even more special with your cards gracing the linky!!! Thank you so much and big, big hugs! Fabulous job with this MIM technique! Both of your cards are gorgeous--love the colors! The close-up of your second card is wonderful. I'm sure the whole card looks stunning with all the sparkle and shine! Love them both! I am going to have to call you the queen of shimmer and what wonderful photos you take of your shimmer cards! wow! These are both beautiful! I don't have any cover plates, but your cards make me wanna get some! Wow, what a technique...thanks for showing it to us. Your cards are so sparkly and light. After I just finished ranting about not buying one more thing, here comes something to make me change my mind. I do not have any of these cover plates, but if I did, I would surly try out this fabby technique! They look so awesome, Darnell! Interesting technique Darnell. Looks sorta like you used a spray gun. I must get mine out and try something with it again.Love the results of both cards. Love both of these cards, Darnell. Sorry I'm coming by so late. Both cards are so very nicely done. I'm so sorry for my late visit...Two really beautiful cards, Darnell! I love how you created your own banner on the first card and the sparkle on the 2nd one is just gorgeous! Thanks so much for playing along with us this week at ATSM! I wouldn't have called it 'pooey brown', more like 'I shouldn't have drunk that water in that country' brown...lol. Love the gold with the flowers and your so lucky to have so many large die-cuts. Both of yours are gorgeous and its such a good idea to use the water colours with them. And of course if Laura says its a good idea, it must be!! I always say I want to be Laura Bassen when I grow up, does that mean you will be my Mum too????? It just keeps getting better.. I think this came from the Papertrey Ink tutorial.. I have this plate and must CASE this for myself.. I will give you credit, I promise!! These colors are wonderful and the gold BG is the icing on the cake.. Your take on the Card Concept challenge is perfect!! L-O-V-E!! Darnell, these are amazing! I love how you colored those cover dies, absolutely stunning. The metallic gold behind the flowers is gorgeous. Thanks for celebrating our 300th challenge with us at JUGS! I definitely have colours needing cover plates, Darnell!!!! Don't have any of those to play with!!! Your beautiful cards might just have me going shopping!! !